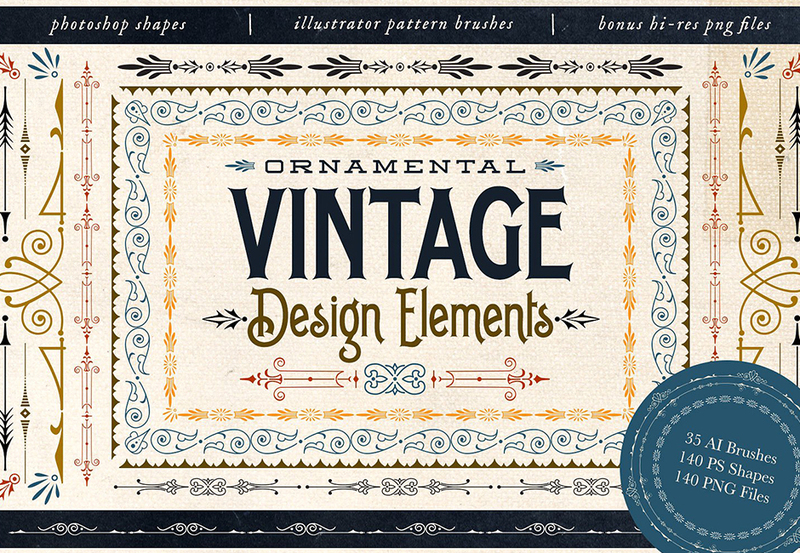 Ornamental Vintage Design Elements includes all sorts of designs pieces to enhance your vintage-inspired project. All these elements were created based on antique designs, but were recreated with smooth, clean lines. Included are Illustrator brushes, Photoshop shapes, as well as bonus hi-res .PNG versions of each brush, shape and frame. You can easily create borders, frames and corners with these tools. • Set of 35 Illustrator Pattern Brushes (.EPS) – Some of the brushes have corner designs and some do not. Please be aware these won’t work in Photoshop. • Set of 140 Photoshop Frame Shapes (.CSH & .PSD) – Circle, Oval, Square and Rectangle (please be aware that some of the shapes are not perfectly round or square). • Set of 50 Photoshop Vintage Shapes (.CSH & .PSD- Each of the 35 brushes are included as shapes plus an additional 15 shapes (please be aware that some of the shapes are not perfectly round or square). • Set of 190 Hi-Res .PNG Files (.PNG) – All have transparent backgrounds and are 1800 pixels at the widest (please be aware that some of the shapes are not perfectly round or square). Software compatibility: Adobe Photoshop and Illustrator CS1 or newer. .PNG files will work with most graphic software. Software compatibility:Adobe Photoshop and Illustrator CS1 or newer. .PNG files will work with most graphic software. File size is approx 60MB (2.5GB unzipped), offered as a single download.